Irongoddess - Follow your bliss!! : Kermit is MY MAN!! Alright, I had a rest day in my schedule today. Good stuff. Been feeling burnt out emotionally and physically recently what with everything going on. Brought my car to the garage today and got chastised for being late on getting the oil change. Not good for the car and I agreed. While I was waiting for it, I went to a friend's house for lunch, and I don't know what was with me, but I couldn't open the door from their porch into the kitchen. I couldn't understand, then M. looked at me, and told me that it would help to turn the doorknob (instead of just pushing). Ugh. I think I'm exhausted. So I picked up my car and went to my physio session. Nerves are healing well - I have had a lot less trouble with my shoulders and arms this week. Good, good, but on the other hand, my neck was hurting, but C. found the spot that was causing trouble and worked on it. OUCH! And since I didn't have to train today , we can move onto another topic. 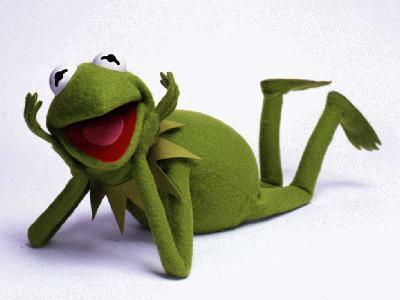 This is my dream man ... Kermit the frog. He can sing and he can dance. He's nice to all the animals and humans and considerate and well-mannered. He's intelligent and witty, has a great sense of humour. Kind and generous ... honest, a natural leader, quiet but confident. He's perfect for me, except he's green ... and a frog ... and a Muppet. posted by Silly Sally @ 11:08 p.m.